Today is a quick post! As I stated last week I’m trying to get back to sewing some basic pieces, mainly separates. I love the shoulder panel on Mimi G for Simplicity’s 8750. It a neat twist on a simple turtleneck. Stripes are one of my favorite patterns (second to houndstooth) so I loved that Mimi used stripes on her version. This stripe knit has been in my stash for years (it was a flat fold buy from Hancock) and it was the exact yardage required! The solid black knit was pulled from my bag of scraps (this is why it’s hard to part with them). One of the reason I love working with knits, is they are often quick sews due to the lack of darts and pleats. This shirt can be made in a couple of hours. I regret not batch sewing three or four of these, maybe next time. I only have two things to point out. The first is consider your fabric choice. The knit I choose was a light sweater knit and you can see that my collar isn’t stiff enough to hold it’s shape. I don’t mind that it has a little drape, but if you prefer more of a traditional turtleneck look choose a heftier knit, like a ponte. The second is the top is long! This isn’t a complaint but an observation. It is too long to wear outside for my tastes. Still I prefer the extra length to it being too short. It also gave me the great idea to extend this to a dress later. Pattern Description:Combine street and chic with Mimi G’s sportswear set for Misses. Top features a slouchy, loose turtleneck or V-neck with slim sleeves and a contrasting panel with gathers. Pair it with oversized tracksuit trousers with pockets and snaps along the side and optional ribbon trim. Sizing: 6-14, 16-24, I sewed an 18. Would I sew it again? Yes, it’s a good work shirt. Conclusion: A nice twist on a basic turtleneck. *This link is an affiliate link and I will receive a small commission if purchase through this link. 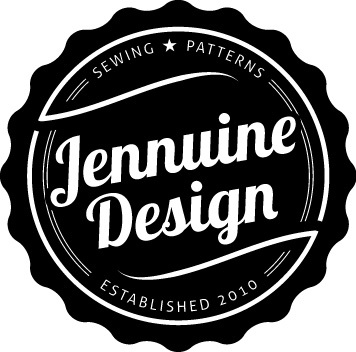 I shop and Fabric.com and recommend them.